Why Watch it Today? : Dreyfus destroys the U.N. building on October 9th to show he is serious. 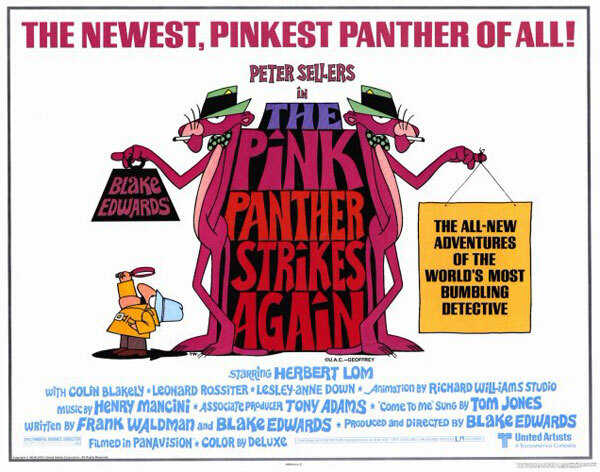 One of the better entries in Blake Edwards Pink Panther series, probably because the focus is once again not on jewel theft but on Dreyfus’s hilarious but ineffective attempts to murder Closeau, a role which Lom plays with relish. The nods to the James Bond series, particularly the scenes where all the world’s best secret agents try (and fail) to kill Closeau are quite fun as well. This entry was posted in Comedy, Cops, Crime, Detective, Espionage, Movie of the Day, Sequel, Slapstick, Spoof and tagged asylum, Best Original Song Nominee, blackmail, Blake Edwards, Britain, Burt Kwouk, castle, co-production, Deep Roy, doomsday machine, France, Germany, Henry Mancini, Herbert Lom, hit man, incompetent cops, insanity, Lesley-Anne Down, Oktoberfest, Omar Sharif, Peter Sellers, scientists, secret agent. Ha! I still remember seeing this back when it first came out and cracking up too much as the insanity of it all. I think Encore ran all of the PP flicks a few months back and seeing it again, I actually find it not as great as I remember, but still pretty funny thanks to those assassins and Lom’s unhinged performance. I like how he basically had a Death Star-like weapon but STILL couldn’t kill Clouseau.